One of the trappings of running a small business is that you can get so bogged down in actually doing the work that you can neglect things like updating your website and sharing all the projects that you have been working on. 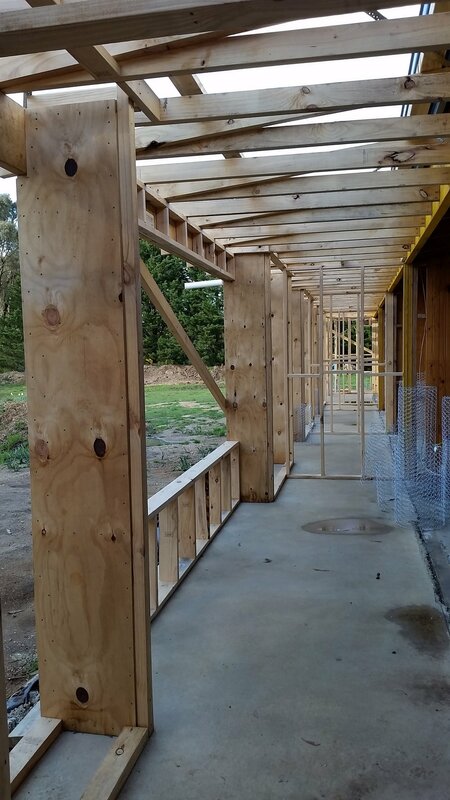 Well at Enduring Domain we have had our heads down and bums up all year designing new innovative sustainable homes, but the most rewarding thing for us is to see these homes start to materialize out of the ground. This is our version of the ubiquitous black box. Its a weekender for a young family in Clunes. Its all fairly low maintenance with thermally broken aluminium windows, Weathertex cladding and a corrugated iron roof. The eaves are lined with an open batten system to allow fresh air ventilation into the roof space. A couple of whirlybird ventilators at the top of the roof exhaust all the warm moist air from the building to keep the building cool in summer and free of unwanted condensation. The building is also wrapped in a breathable waterproof membrane. 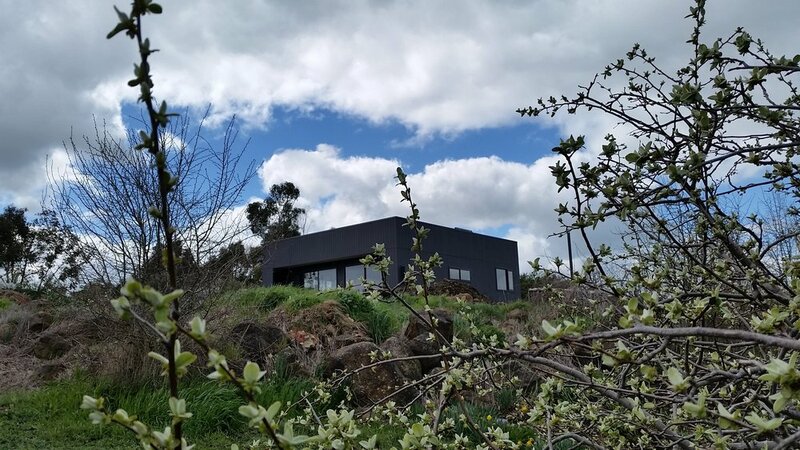 The box cuts a striking silhouette on its hill top site. The home will be fairly self-sufficient, using a small wood-heater, a solar hot water system, rain water tank and on-site waste-water treatment system. Currently under construction by Evoke Building Group. This is our big strawbale retrofit and addition to an ‘80s kit home in Haddon. Keeping the existing low pitched roof and timber ceiling in place, we pitched a new truss roof over the top to create plenty of room for bulk insulation. New external walls are framed up to accommodate strawbales as can be seen with the custom made ‘wall buck’ wide section posts. Here we can see the train tracks over the slab where the bales will sit and the wall buck forms a kind of book-end to keep things nice and straight. Beside this is a window opening where there will be a standard stud wall below which allows a joinery unit to sit within the depth of the thick strawbale walls. Blinds can be fixed to the recessed stud wall above to keep things neat. This home is completely off the grid and runs solar hydronic slab heating, with the same system also pre-heating the domestic use hot water. There is a large ground mounted photovoltaic array to provide all the electricity needs for the home. This is being built by master strawbale builder Per Bernard. Here we see part of the north facade of our Ballarat ‘Future Heritage’ project. There are three wings which sit on different levels, terraced onto a hillside, rather than cutting into it. Its a historical area from the gold rush days and I think its important not to permanently alter our historical landscapes. The angled roof overhangs either allow sun or prevent sun from penetrating the glass at different times of the year. There is a rustic but modern palette of materials. Chunky natural timber posts, corten rusted steel and hardwood timber shiplap cladding. The lower living area and upper bedroom wing are built on concrete slabs. The tall north facing windows will cast light deep into the spaces during the winter to provide passive solar heating and store heat energy in the polished concrete floors.